Title: Friar Bacon and Friar Bungay. Language Difficulty Rating: 5 (medium difficulty). Setting: Suffolk Shire and Oxford, England. With Friar Bacon and Friar Bungay, Robert Greene created a play which is far superior in every way to the one he was clearly inspired by, Christopher Marlowe’s Doctor Faustus. Not just a tale of the supernatural, Friar Bacon is a weird love-story, framed three ways by a lusty prince, an honest lord and the beautiful daughter of a gamekeeper. You are encouraged to read Faustus and Friar Bacon back-to-back, not just to get a sense of what a Londoner might have felt if he or she had seen both plays, but also to see how much of the feel, language, and even vocabulary the two dramas share. 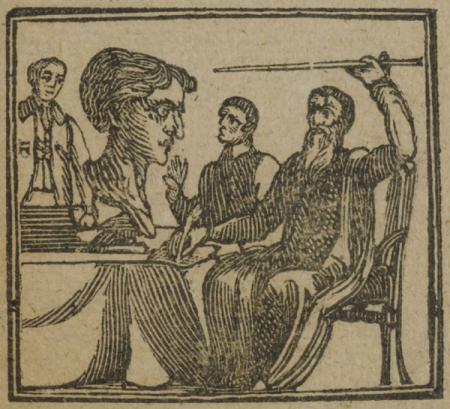 Our Story: Friar Bacon, a scholar of Oxford University, has earned a reputation for being the foremost sorcerer of England, and perhaps all of Europe; his big project is to construct a giant talking brass head which will teach him all the secrets of the universe. Meanwhile, Edward, the Prince of Wales, has fallen in lust with maid Margaret, and sends his best friend Lord Lacy to court her on his behalf; but Margaret falls in love with Lacy instead!